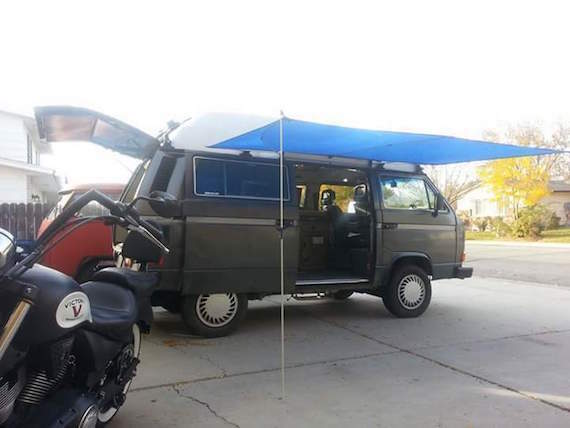 Following in yesterday’s rough-but-affordable Vanagon Syncro footsteps, we have an interesting DIY-Syncro Camper with a no-reserve auction. 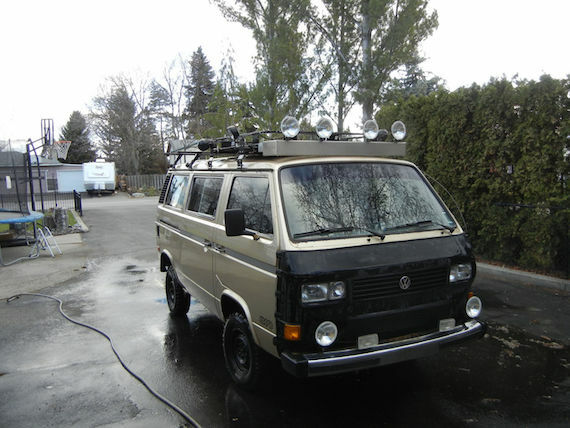 It started as a tinop Vanagon GL Syncro but has experienced many surgeries – cosmetic, mechanical, electrical – to make it a much more versatile and reliable van. The Subaru 2.2 is good for speed, the hightop is nice for headroom (there’s no bed in this one) and the Westy kitchen is a huge camping bonus, but what really catches my eye is all of the little aftermarket touches the seller has installed to make this van much less of a headache down the road. 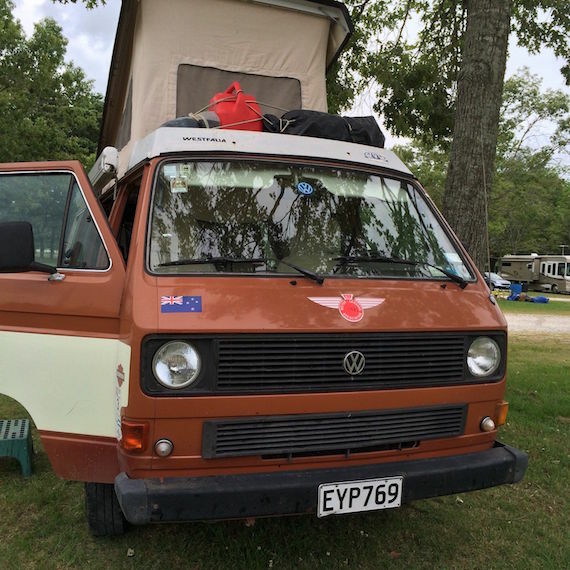 GoWesty relays, circuit boards, stainless lines and coolant pipes… these are details that increase confidence that this is a solid Vanagon bet. There are also plenty of less-consequential but still cool pieces coming with it, like insulated curtains, van shower, bike racks, awning, and good-looking Audi 5000 wheels. It shows some exterior blemishes, but nothing bad; they’re like an old climber’s sunspots on his nose and cheeks. This thing was built for adventure and reconstructed for even bigger ones. 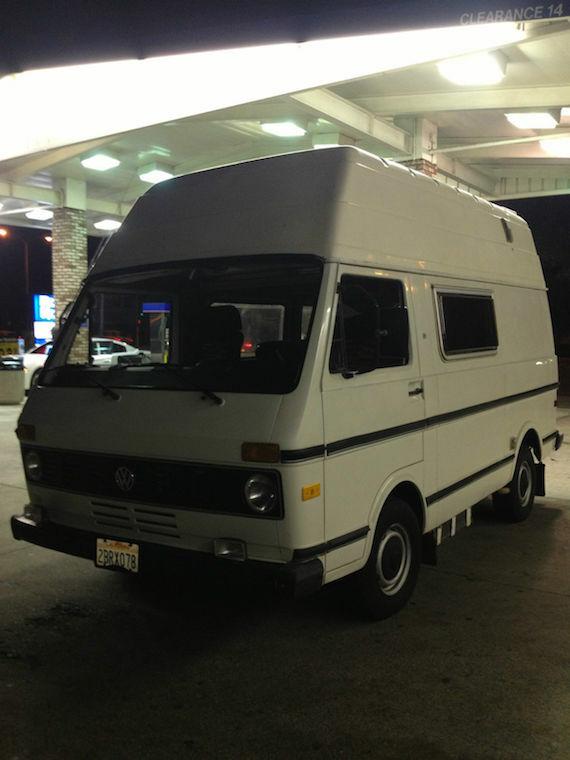 The seller of this van affectionately calls it “Big Ugly” after 15 years of rough and tumble ownership. There’s plenty of blemishes and rusty seams to make it not just a clever name, but if you’re not too worried about aesthetics this van has a lot going for it. A Westy kitchenette is installed and fully functional and it runs well. He says it needs a few coolant hoses and possibly other things he doesn’t know about, but if you purchase Big Ugly at the Buy It Now of $12,350 he’ll take it in and get them done along with up to $2k of any other repairs. Bidding is currently closer to $5k right now, so maybe some haggling needs to be done on the phone. Anywhere in that range, it’s a lot cheaper than 95% of the Syncro vans you see. 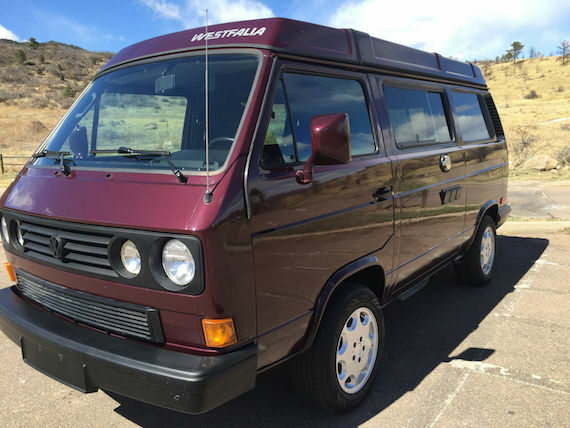 This Burgundy Westy has covered some ground – 156k miles in its life – but it’s been pretty much completely refurbished mechanically with some great cosmetic touches too. Outside, its been repainted in its beautiful original hue and has the perfect (if ubiquitous) GoWesty wheels. The South African grille is another popular mod, but the quad-round setup just looks so darn good. Inside, the front seats have been replaced with blue and grey cloth Recaros from a Jetta GLI that don’t quite match the rest of the just-grey interior but are still quite sharp. All seals and the tent were redone at the time of repaint (a few years ago). The engine and transmission were rebuilt and the suspension and brakes are redone. So yeah, pretty much everything. The market is strong for nearly-perfect, well-tended Westys like this, so the seller is probably feeling pretty confident in their $29.5k price. 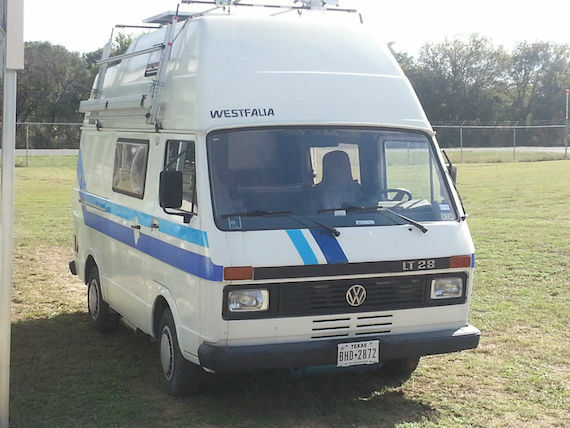 Last month we featured a rare Sven Hedin edition of a VW LT28 Westfalia. It had a lot of style and promise, but looking deeper past the Playmobil-esque lines showed a van that needed serious love and effort inside and out. Today’s 1980 model look to be cleaner throughout, though the single exterior shot leaves plenty of opportunity for hidden blemishes. The interior while still heavy on the 80s style, is notably better and doesn’t have the saggy-bags on the wall. Under the hood it has a recent turbodiesel heart transplant from a 96 Volvo. Despite originally living in the other Vol-car, these DT24T engines were actually built by Volkswagen from 1982-1992 and are as close to OEM+ as you can get for the LTs. With both the turbo and the intercooler, it pumps out over 120hp, a big improvement over the original 74hp. 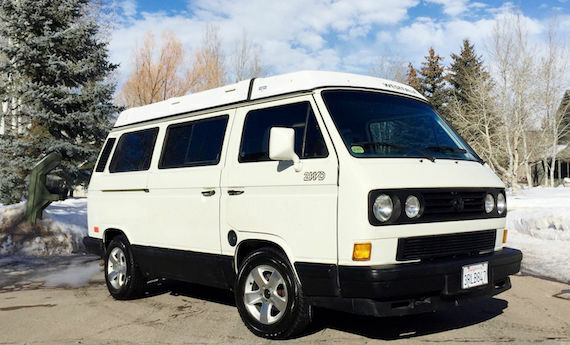 With highway capability, a dated but ready-to-use interior, and a simple, clean exterior, this is a great plus-sized alternative to the standard T3 Westy. 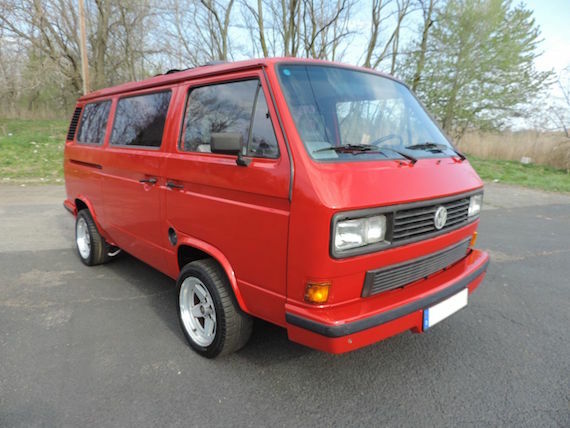 We’ve posted some interesting variations on the Volkswagen LT vans, the plus-sized Vanagons that never came to the US. From firetrucks to zombie defense vehicles to race team vans, they’re like VW’s Sprinter. 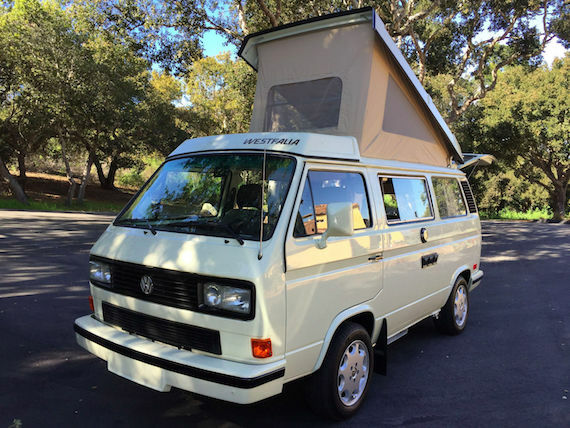 Today’s LT28 model, indicating the lightest gross vehicle weight available (they went up to the LT55), is a special edition form Westfalia called the “Sven Hedin,” the Swedish world explorer. The bigger size of the LT allows for more amenities than would ever fit in a T3 like a shower, while the hightop makes standing up much more comfortable. The size and rarity are definitely the main draws here, as it’s showing some wear after its 125k miles and 28 years. The interior looks original but droopy, especially the wall-mounted cloth storage sacks. The exterior shows some cracked and possibly redone paint areas, and the incredible blue stripes have seen better days. 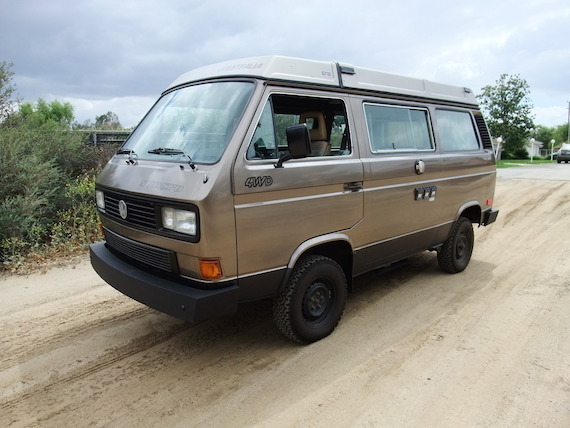 All of the thick plastic Westfalia interior bits look great though and the turbodiesel inline-6 should be just getting into its prime, so as long as there aren’t a bunch of rust spots hiding, I think it has a lot of potential as a plus-sized camper.